Recession be damned! The world awaits you, graduating seniors–who were born when Shania Twain hit the video scene, cavorting about in midriff-baring vests like a show pony, which, incidentally, seems like it happened early Tuesday. See how time flies? No matter! You’re a high school graduate now. March into college with your chin held high! Inevitable burden of student debt be damned! Can’t you see the looks on those happy teen’s faces above? The world is your oyster! Actually, that guy has quite a firm set of crow’s feet there, doesn’t he? And that receding hairline. Is he a senior or a senior? Whatever, I’m getting sidetracked. The point is, high school is over. So over. So yay! Although you will think about it intermittently over the next few decades, as you fret over lost relationships or struggle with regret and forgiveness and bitterness. But whatever–your generation has the benefit of social media! Like, you GREW UP with it already existing. You know all about apps and tweets and those stupid things like L8R that young people text, which isn’t even connected to proper English. Do you even know how to write cursive? Anyway, the point is that life is like lying on a bed of daisies from here on out. That picture reveals all. 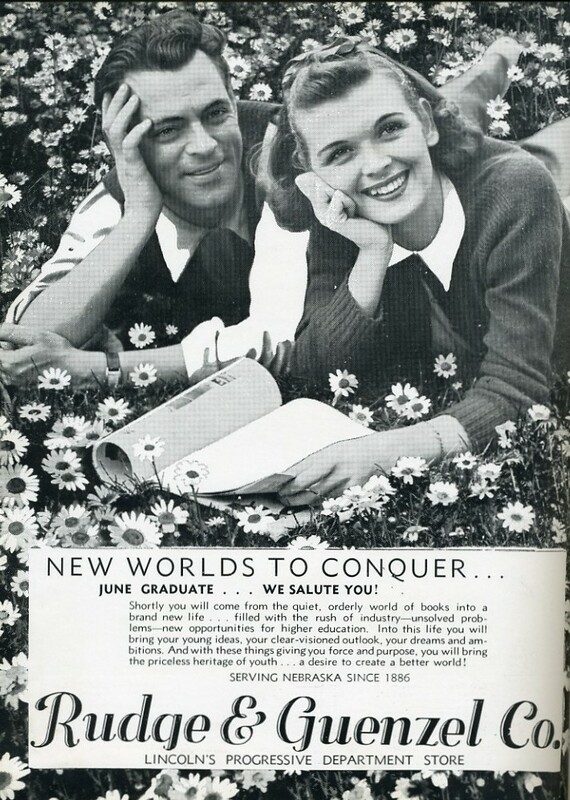 Granted, it was taken in June 1941, so I guess those teens are your grandparent’s age? Oh, great-grandparents? Damn. Well, look how happy they were. Maybe technically we weren’t fighting in WWII yet, so the future looked bright at that moment. Of course, by December, there was Pearl Harbor and then you know what followed. Oh, you don’t? WTH? Don’t they teach History anymore? So what happened was the Allies won ultimately. Cool, huh? And then there was peace and young people moved into cookie cutter houses like Levittown and all was right. Except then there was the Korean War. And the Cold War. And Vietnam. That one didn’t work out; you can see the aftermath of that on street corners. You’ve probably never heard of the Falkland Island War or Desert Storm… Anyway, the Berlin Wall came down, so it’s all good. Except for the Middle East and North Korea and the debt to China. But things will totally work out. Ebb and flow, you guys. You got this. Totally. And just in case you’ve never heard this SUNSCREEN song (which I still cannot FATHOM is as old as YOU ARE), take heed: http://www.youtube.com/watch?v=I5NAPZp2w-o. It’s a way better motivational speech than I could ever give. Quite the synopsis. I bet half of the new H.S grads would find your post full of new info. Oh you’re right about the old “senior”. I bet he is one of her teachers offering her some valuable outside “tutoring”. That was my concern. You can tell he wants to spoon her. Do we even bother with Grenada or the Bay of Pigs incident at this point? Should the just look it up later? You know, I almost put Bay of Pigs, but I thought, well, wasn’t that more of an incident? That was 50 yrs ago, and we STILL have an embargo! I agree with you on the bitterness and the Ben part. Other parts I didn’t really see.